The funeral of Jacintha Saldanha, the nurse who apparently killed herself following a royal hoax call in London, is taking place in her Indian hometown, Shirva. 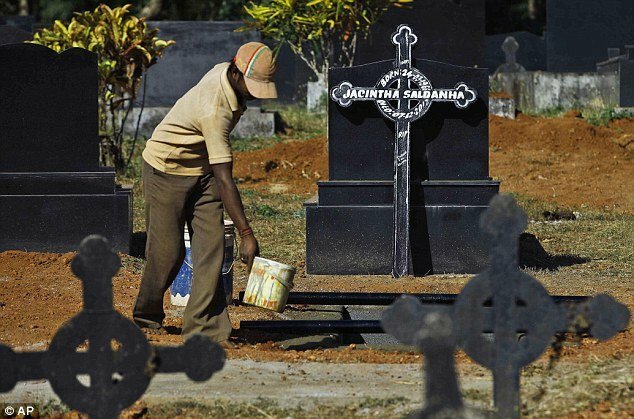 Jacintha Saldanha, 46, will be buried after the service at a church in Shirva, just outside Mangalore on the south-west Indian coast. Her family arrived at the church earlier with her coffin. Jacintha Saldanha had taken a prank call about Kate Middleton who was being treated for acute morning sickness. Two presenters on a Sydney-based radio station convinced staff they were the Queen and Prince Charles, and were connected to the duchess’s private nurse and given an update on her condition. Jacintha Saldanha, who transferred the call, was found dead days later, in nursing accommodation attached to the King Edward VII hospital. Her funeral was preceded by a memorial service and she is to be buried at a cemetery on the church grounds in Shirva. Jacintha Saldanha’s husband, Benedict Barboza, visited the cemetery on Monday morning to look at the grave where she will be laid to rest. Thousands of people were expected to attend the service, and the authorities had made extensive arrangements, including deploying additional security. Earlier, local police set up barricades because large numbers were expected at the funeral. There had been “massive media coverage” in India following Jacintha Saldanha’s death. The death had saddened many in the country, especially in her hometown, with some people saying it was a tragedy that simply should not have happened. Others have called for a fresh investigation to determine what led to her death. Jacintha Saldanha left three suicide notes, her inquest last week revealed.